Have you ever made homemade bread? I have to say I find it one of the most rewarding things to do. It can be a labor of love, but there is something so satisfying about it. It’s guaranteed to make you feel super-proud of yourself! And honestly the taste can’t be beat. So much better than store bought! I have a handful of great bread recipes on this site, like these homemade crescent rolls, this cinnamon bread, and these soft overnight brioche buns, but the most versatile, every day recipe of all would have to be this soft whole wheat bread. In my family, it’s our go-to! We love it because it’s so soft, pillow-y, and moist, with just a slight bit of nuttiness from the whole grains. It’s really a perfect everyday loaf! IS WHOLE WHEAT BREAD HEALTHY? Bread is carbs, there’s no way around that. Even when it’s 100% whole wheat! But wheat bread is definitely a healthier alternative, because whole wheat flour has a lot more fiber and nutrition than the more processed white flours. 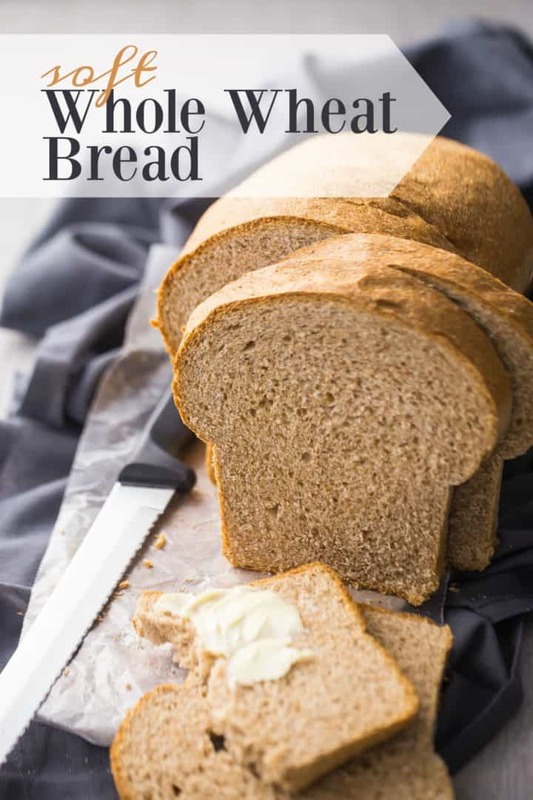 Making homemade bread can often seem a little intimidating, but I promise you, this recipe is so easy. It’ll have you making your own bread every week! Start by dissolving your yeast in a little warm water. This usually takes about 5 minutes. Once that’s looking kinda frothy, throw in the honey and butter. Then add just 2 cups of the flour. Beat that in for about 3 minutes, then gradually add in more flour until you see the dough forming a ball. Once that ball of dough is pulling away from the sides of the bowl cleanly, it’s time to knead. You can knead this bread dough by hand, or let your mixer do the work for you. I kind of like kneading by hand. But sometimes I’m too busy and I just leave it in the mixer so I can do other things. Either way will work! After about 10 minutes of kneading, you’ll see that the dough looks really smooth and elastic. Just mist your mixing bowl with non-stick spray, pop in the dough, mist the top of that too, cover with plastic wrap and allow it to proof (aka: rise). About 30 to 45 minutes later, you’ll see that the dough has grown to almost double what it was before. Punch it down, form it into a loaf shape, cover, and let it rise a second time. Bake the bread until it’s puffy, golden brown, and gives a hollow sound when tapped. Besides just eating it warm from the oven, this homemade bread can be enjoyed in so many ways. It’s perfect for sandwiches, because of it’s soft, pillow-y texture. And it toasts beautifully! I love to slather it with butter and give it a sprinkling of cinnamon sugar, or a swipe of jam. That plus a cup of hot, milky tea and I’m in heaven. You could also use it as a base for your avocado toast! If you find your leftovers are starting to get a bit dry, use them for French toast or bread pudding, or whiz them up in the food processor to make bread crumbs. 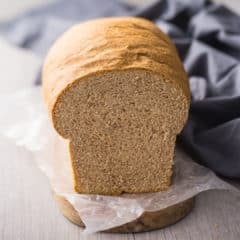 To make a vegan version of this soft wheat bread, just sub out the butter for a vegan butter substitute. Look for one that swaps 1:1 for dairy butter. And the honey can be replaced with an equal amount of brown sugar or agave nectar. HOW LONG DOES HOMEMADE WHEAT BREAD LAST? 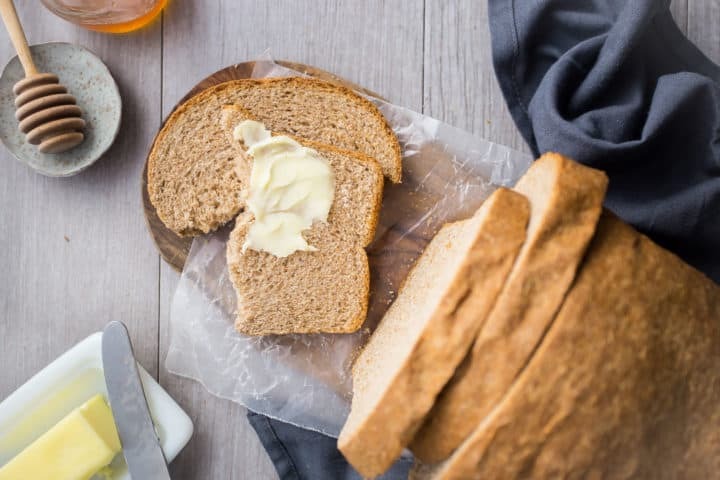 Homemade bread doesn’t last quite as long as store bought, and that’s because it doesn’t have all those same preservatives to keep it shelf-stable. Once this bread is completely cool, slip it into a plastic bag to keep it from drying out. Then keep in in the fridge. It should last for at least a week. You can also freeze it! I’d recommend slicing it first, that way you can just grab a slice or two from the freezer whenever you need it. It thaws very quickly. At room temp it would probably only take a half hour or so, or pop it into the microwave for around 10 or 15 seconds. Treat your family to a homemade loaf this week! It’s easy, fun, and so delish! 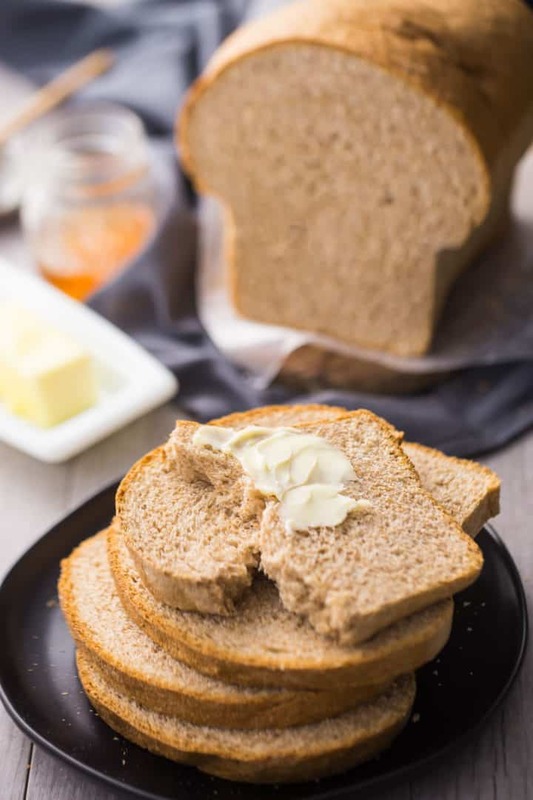 You won't believe how easy it is to make homemade whole wheat bread! This recipe bakes up soft and is perfect for sandwiches. Add the honey and butter. Love the recipes, and your directions are so easy. Thank you! I’m so happy you are enjoying. Really appreciate the positive feedback! Hello. Line 3 of the Instructions indicates salt is added with the flour. Salt is not shown in the list of ingredients. Should salt be added and, if so, how much. Thank you. Yes, sorry for the error. The amount of kosher salt is 1/2 teaspoon. The recipe card has been updated. So sorry about that Lynn! It’s 1/2 teaspoon of kosher salt. The card has been updated! You left out the salt in the ingredients list..how much? Thanks for catching that- it’s 1/2 teaspoon. Updating the recipe card now! Homemade bread is so good, but often it’s so dense and heavy. This recipe is great though! Soft and fluffy homemade bread- perfect! Hello there, can I substitute honey with maple syrup? Did you use bread whole wheat flour or regular wheat flour? Yes that substitution should work just fine. I used whole wheat flour. Good luck! Yay! So happy the recipe worked well for you Yulie! Congrats and thanks for the positive feedback! Finally, someone who says their whole wheat bread recipe is soft and it really is. KUDOS to you Allie! This bread is really yummy. When I make it next, which will be REALLY soon, I am going to add an additional 1/2 teaspoon salt and possibly some vital wheat gluten. Sounds great Deb! I’m so glad you were happy with the recipe! I baked the bread but it didn’t risen much in the pan it was not square. And why it was not fluffy though soft..
Not sure I understand your question Pooja- did you bake it in the proper type of pan that’s called for in the recipe card? Are you saying that it was fluffy and soft or no?